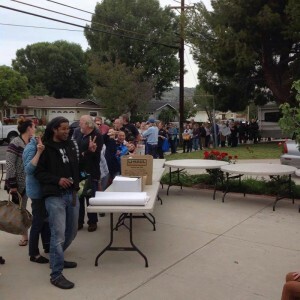 People are lining up for estate sales and last Tuesday, Estate Sales News reported on a Collector Hoarder estate sale in Chatsworth, CA. Well here is the opening day line of people for entrance to the sale on Thursday morning, April 7th. There are over 40 million people in the United States age 65 or over. The baby boomer generation is retiring and on the move. They are turning to estate sale companies to help them downsize and be able to enjoy their retirement years. The company that handled the Chatsworth estate sale has been in business over 20 years with a lot of experience by the owners and their staff. To achieve lines of people similar to this an estate sale company needs a great reputation not only with sellers, but with buyers. They must have expertise in knowing where their market is and the best way to reach them. Good photography and staging of the merchandise for sale is important. An estate sale company also needs a home with desirable contents. Focusing buyers attention on collectible, rare, unique, or desirable items, along with everyday useful items likes linens, cleaning products, clothing, and other contents at substantial savings over retail. When choosing an estate sale company take the time to visit the estate sale companies you are interested in, especially on opening morning. See what size of line there is, are they in an orderly fashion for entering the property and are signs or announcements made to provide the instructions of the way the sale will be conducted including the check out. When you enter the sale look at what contents are for sale, how they are organized and are there prices visible. Estate sale companies will welcome prospective sellers at their sales. Doing your due diligence is your responsibilty and relying on outside sources is not a guarantee of a good estate liquidator. Be your best investigator and always ask your friends, neighbors, attorney, or realtor for someone they recommend.